Grail time here… I got back to school yesterday, and today went to the mail room to track down an elusive score. Conspicuously absent from my Neo Eyezon shoot was this Tokyo Magazine exclusive release via Dream Rockets. This guy has an orange rub and green sprayed accents on GID vinyl, and was actually the first production GID release, which snuck under most people’s radars. The rub work admittedly is not amazing on this figure when compared to some of the Ream X Head, but the colors are great. I also snapped a couple shots of the eclectic mix of vinyls that made it to school with me… there’s a few other toys here as well, but there’ll be time for that later. EDIT: Added at the end is a shot of the three newest Neo Eyezons I received in the mail today. The two two-tone figures are the latest release in Japan, and the red with silver and green spray figure is actually one of two Christmas-themed figures painted by the legendary Goto-san himself. I hadn’t seen the Christmas one before, and was thrilled when I opened the box. 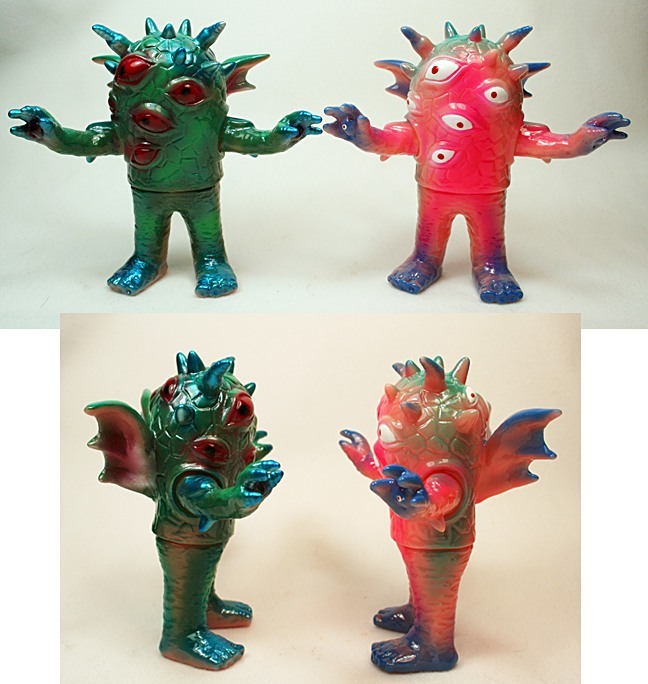 I’m also looking forward to adding the Kikaida colored figure to my slowly growing Kikaida tribute color group.